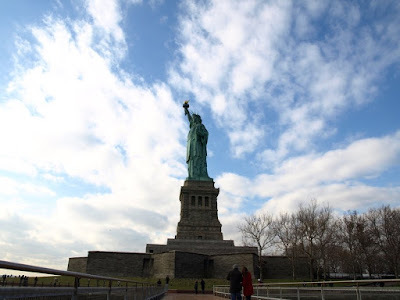 We took the Liberty and Ellis Island tour today. - got pizza and rude treatment from a waiter who acted like he was from the Soviet bloc (and probably was). I snuck out onto an abandoned pier with my daughter and took a standard shot of the Lady in the Harbor. 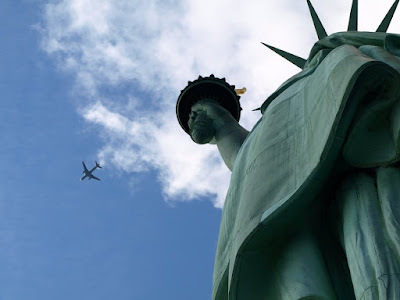 Climbed up the 145 steps to the observation deck and caught a stray jet while zooming in on Lady Liberty's arm and torch. 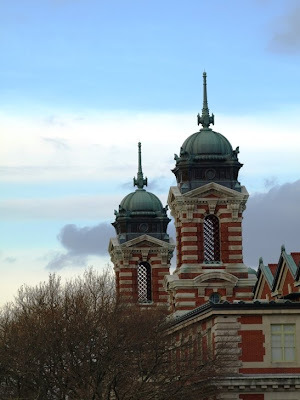 Two of the four cupolas of the main building on Ellis Island, shot as the ferry departed.